Apple has started to air a new iPod ad that encompasses the entire lineup, ranging from the new iPod touch to the new iPod Nano and even Shuffle. 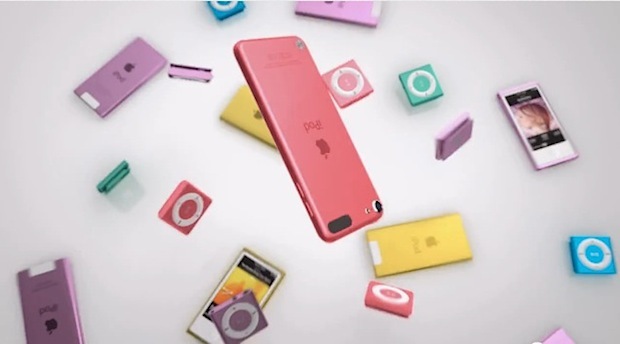 The commercial emphasizes the range of colors offered for each new iPod, with the devices bouncing around on screen to a loud catchy song playing in the background. The song featured in the iPod commercial is “Yeah Yeah” by artist Willy Moon. Apple has a history of including catchy songs in their iPod commercials, which then go on to become widespread hits in music popculture. This ad is much more playful than Apple’s recent iPhone 5 TV commercials, and is closer in line with some of the older and more flashy Apple ads from years past for the iPod. It’s alright but I think the Willy Willy song is annoying, sounds like a marching band falling down stairs! I don’t think that the iPods are bouncing, they are break dancing! Cool.. Love it! I want to bounce at that rythm!!! This commercial is annoying. The song could be ok but in the context it is horrible. Great song! I want my iPod!!!! This commercial bothers me because ipod touches have glass faces. No one sees the problem in this bouncing ipod commercial? Having dropped my iphone – I would certainly not bounce an ipod touch with a glass face. This is patently ridiculous. Overkill on Channel 5* today! This song is driving me insane (in a bad way)!!!!!!!!! !